TEKNOKIA.com - Samsung galaxy Note 7 is the latest phablet on Samsung launches adding to the ranks of the flagship series for the Note. It has code SM-N930V. Samsung galaxy Note 7 is Samsung’s flagship products are provided with a high-specification for intermediate and above class. The hardware supplied by Samsung is Snapdragon chipset 820 or Exynos 8890 octa core processor, 4 GB of RAM memory, Adreno GPU 530/Mali-T880 MP12, as well as 64 GB of internal storage. 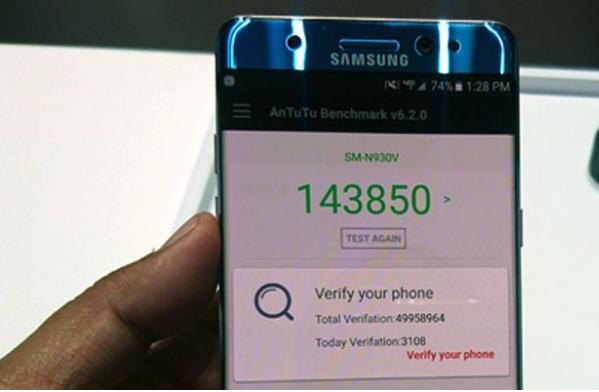 Then how the results of the Samsung galaxy Note 7 after testing the performance of the AnTutu benchmark software? As quoted from KompasTekno journalist who attended the launch in New York on Tuesday (8/2/2016). Here are the results. Galaxy Note 7 is tested the model with an 820 Snapdragon chipset has a clock speed of 2.15 GHz. Note 7 run software An Tutu Benchmark version 6.2.0 and at the end of testing produce score 143850. The score is the sum of the score 3D: 57555, score UX: 43642, CPU score: 31206, and score RAM: 1147. Score An Tutu Galaxy note 7 beat score of popular mobile phones such as the OnePlus 3, Xiaomi Mi 5, Galaxy S7 Edge, iphone and iPhone 6S SE.